For The Spaniard’s 30th birthday I wanted to do something special – I wanted to take him to his first NBA game. Unfortunately, preseason was still going on during his actual birthday, so I couldn’t deliver on my gift until two weeks later. Thanks to the city suggestion from my old roomie Marc, we decided on San Antonio so we could catch the Spurs. We had an early morning flight with two connections, so by the time we arrived in San Antonio we were exhausted. Our hotel was conveniently located along the river walk, a world-renowned urban waterway below street level, which allowed us to orient ourselves with the downtown just 15 minutes away. On our first morning we set out along the river heading north towards the Pearl Brewery district, a very cool area that mixes residential, restaurants, shops, a hotel, and a branch of the Culinary Institute of America into refurbished (and a few new) buildings from the old Pearl Brewery. Saturday happened to be market day so we grabbed a gluten free banana nutella crepe and joined the free walking tour where we learned all about the origin of the brewery, its closure in 2001, and the timeline of the redevelopment to the space it is today. On the tour we popped into Cured where we saw the incorporation of vintage equipment from the administration building into the restaurant it is today. After the tour we settled in at the Boiler House for an awesome breakfast. The Spaniard opted for a serving of bread pudding french toast, while I had green chili pork and grits. He really goes on a gluten overload when we go on vacation. We stopped into the Hotel Emma after lunch to see how the Pearl’s Brewhouse has been transformed into a boutique hotel featuring a number of reuse features throughout the building. The Sternewirth bar definitely had some of the most original recycled materials from the brewery. On the advice of our Pearl tour guide we headed south to the Mission San Jose (bonus points to the San Antonio transit authority for having free wifi on their public buses). Known as the “Queen of the Missions”, this is the largest of the missions in San Antonio and was almost fully restored to its original design in the 1930s. We arrived just in time to catch a bride set to walk down the aisle in the historic church. We popped into La Villita Historic Arts Village where a Day of the Dead celebration was in full swing. On Saturday night we hopped in an uber for a ride out east to the AT & T center for the home opener of the San Antonio Spurs. Since we didn’t have jerseys I asked these kids to jump in the photo with us (while I thought it was hilarious, and the kids parents were smiling, The Spaniard thought I was totally creepy). We missed out on autographs from the cheer team, but had a chance to join creeper row as they all filed into the arena. The game was very different than a hockey game – the game starts right after warm up (no waiting to flood and freeze the ice), they play music during the play, and well the mascot had a turbo charged t-shirt gun. The Spurs won their home opener – and the birthday present was a success. 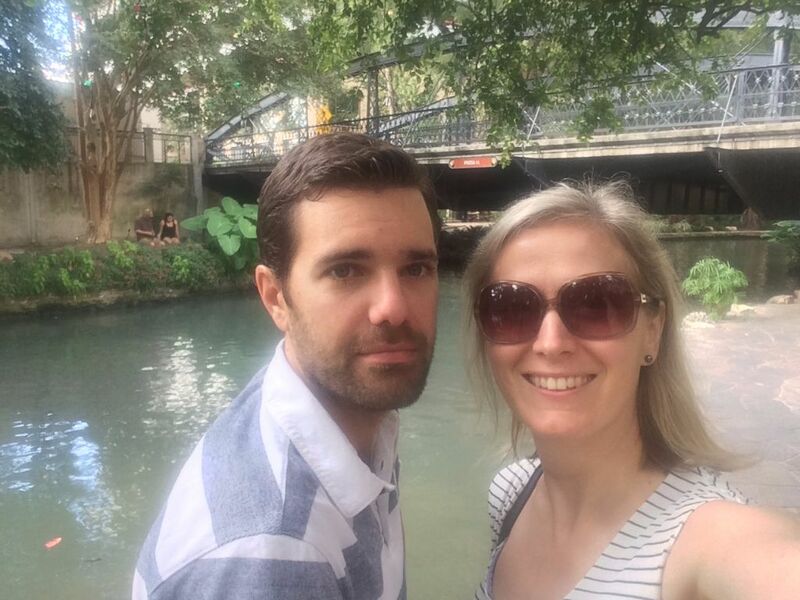 I have to thank Marc for the recommendation – San Antonio is a really lovely city. We loved walking along the river walk – and even found a few places to sit down and have a bite (for more gluten). Our experiences dining out were awesome. We had a memorable Mexican meal at Mi Tierra Restaurant & Bakery. Sort of had that fiesta all the time, no matter what the season feel about it. After leaving Mi Tierra we happened to walk by the San Fernando Cathedral in time for a free concert; the Musical Bridges Around the World event featured Van Cliburn Gold Medalist, Vadym Kholodenko on the piano. Since our flight back to Edmonton didn’t leave until 1:30 we had time to walk back to the Pearl Brewery on our last morning for breakfast at Supper in the Hotel Emma. Its not often that I can indulge in some gluten free pancakes and a french toast sandwich, but thankfully The Spaniard was willing to share with me (with a bowl of gluten-filled croissant trifle on the side). I think San Antonio is a great city with loads of culture, history, sports, and great food. We loved how walkable it was – a great option for anyone looking for a long weekend getaway from Edmonton.